Has a Democrat Got a Chance of Becoming Governor of Texas? Texas Governor Rick Perry has not had much to say about the Deepwater Horizon oil-spill debacle in the Gulf of Mexico, except to note that Texas is prepared should the oil head toward its shores, that he hopes no hasty decisions are made about shutting down offshore drilling and that he is not inclined to get into the blame game. But while the federal government, neighboring states and BP grapple with the spill, Perry has opened up his own front in the Gulf Coast environmental wars as part of his ongoing anti-Washington campaign. Perry is accusing the Obama Administration and an "increasingly activist" Environmental Protection Agency (EPA) of a federal putsch. Earlier this month, he said, the EPA pushed aside the state's prerogatives and said it would determine whether a Corpus Christi refinery, the fifth largest in the state, was meeting air-quality standards. Under the federal Clean Air Act, states monitor pollution levels and issue operating permits to industrial facilities, under the oversight of the EPA. Texas has emphasized the state's role in the law, tending to ignore the federal oversight part, and has taken a more independent approach to the issuing of permits. In the 1990s, over the objections of environmentalists, Democratic Governor Ann Richards and later Governor George W. Bush supported a so-called flexible approach: granting operating permits based on total emissions at a facility. Environmentalists argued that the Clean Air Act calls for pollution levels to be measured at each emissions point or operation within a facility  potentially thousands in a large refinery. For over a decade, environmentalists accused the Texas Commission on Environmental Quality (TCEQ) of lax regulation and urged the EPA to step in. Now the EPA appears to be agreeing with them and has given Texas until June 30 to change its approach or lose its oversight authority at potentially dozens of large industrial sites. The EPA's move, Perry says, will kill thousands of Texas jobs and derail a bipartisan program that he says has helped clean up the air in Texas. The controversy has offered the governor another opportunity to broadcast his states' rights message, a message that proved fruitful for him in the spring Republican primary, handing him a comfortable victory over his Washington-based rival, Senator Kay Bailey Hutchison. "On behalf of those Texans whose jobs are threatened by this latest overreach, and in defense of not only our clean-air program but also our rights under the 10th Amendment, I am calling upon President Obama to rein in the EPA and instruct them to study our successful approach for recommended use elsewhere," Perry said following his attack on the agency. 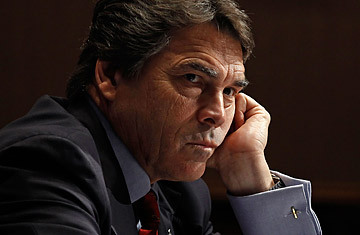 Given the Texas stage for this showdown and Perry's penchant for playing his cowboy persona to the hilt, it was inevitable that the fight would be portrayed with Western clichés. "A new sheriff has come to town, and it's going to put a halt to the illegal permitting by TCEQ," Tom "Smitty" Smith, director of the Texas Office of Public Citizen, told the Austin Chronicle. As soon as the Obama Administration came into power, the EPA began warning Texas that its "flexible" approach was not in compliance with federal law. The first shot in the battle was fired on May 25, when the EPA stepped in and said it would determine if an operating permit should be granted for the Flint Hills Resources refinery in Corpus Christi. The refinery is owned by Koch Industries, the Kansas-based consortium whose political action committee has funded several conservative causes. The Koch family gave Perry $50,000 for his campaign fight with Hutchison. The EPA has given Koch until Sept. 15 to seek an EPA-approved operating permit or face fines. The agency is also eyeing up to 40 additional industrial sites in Texas for takeover. "The state still has the ability to do those permits, if it has a change of heart," EPA Region 6 Administrator Al Armenariz told the Austin Chronicle from his temporary base on the Gulf Coast, where he is working on EPA oil-spill efforts. But Perry does not sound like a man ready to change direction. As the oil industry grappled with a public relations nightmare in the Gulf, Perry traveled last week to the city of Deer Park, a major center of the state's petrochemical industry. Standing with industry leaders and petrochemical workers, Perry blasted the Obama Administration for pushing a "command and control approach" that would "destroy Texas' successful clean-air program and threaten tens of thousands of good Texas jobs in the process." Perry's Democratic opponent, former Houston mayor Bill White, says the EPA takeover is evidence of Perry's mismanagement of the state agency  the governor appoints the TCEQ members. Perry's response has been to accuse White of being in cahoots with the Obama Administration in an attempt to take control of what is rightfully a Texas prerogative. So far, Perry's anti-Washington stance appears to be working politically  he holds a 44% to 35% lead over White in a late-May University of Texas-Texas Tribune poll. One of Perry's favorite sartorial flourishes is a pair of Texas boots decorated with the image of a famed cannon used in a battle for Texas independence from Mexico. "Come and take it" was the cry of the cannon's defenders. That sums up Perry's approach in this battle. It is a replay of his successful anti-Washington campaign against Hutchison earlier this year and is probably fodder for his book Fed Up. Due out this fall, it promises to take on Washington policies as a "legitimate threat to America's continued leadership in the free world," according to publisher Little Brown.